Today is a very exciting day, because I get to reveal my book’s cover at MG Book Village, a terrific site that does so much for the children’s book community! I’ve always been amazed by artists, and am ever grateful to designer Karina Granda and illustrator Ji-Hyuk Kim for capturing this story so perfectly. 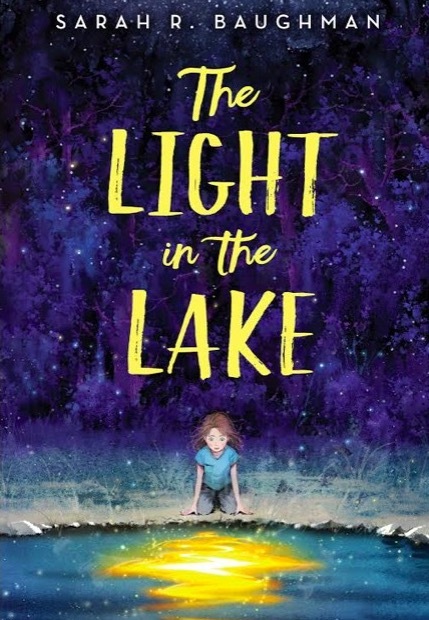 I’m thrilled to share the official news that my middle grade debut novel, THE LIGHT IN THE LAKE, will be published by Little, Brown Books For Young Readers in 2019! This story began as an idea, born in the Vermont woods during a walk with my dog. It grew into a first line (which hasn’t changed), and then, over many early mornings spent squinting at a laptop screen, it became a book. I feel honored to work with my wise and wonderful editor, Lisa Yoskowitz, and her assistant, Hannah Milton. The entire Little, Brown team has been incredibly welcoming. Of course, I’m full of gratitude for my tireless agent, Katie Grimm. Her staunch support and belief not only in my story, but in me, made all the difference. As a new member of SCBWI, I was excited to attend my first annual conference in Springfield, MA this year. Although I couldn't go for the whole weekend, I was impressed when I went to sign up for Sunday workshops at how many terrific options were available; even in just one day, I was able to pack my schedule with relevant, exciting material. I frantically scribbled notes and surely didn't catch every available gem of wisdom, but I finally understand Scrivener's Inspector Panel (thanks to Dee Romito); learned about Feedly, Hootsuite, and other social media tools (thanks to Matthew Winner); and started writing a novel in verse (thanks to Mary Rand Hess)! I even ended up sitting next to Jane Yolen at lunch somehow and babbled inadequately about how many times I'd read Owl Moon to my children (she was very gracious, of course). The energy and inspiration found from sitting in a conference room full of people who share a passion for creating literature for children is like no other! One of the most dramatic scenes in The Great Gatsby, and a terrific Readers' Theater piece! One challenge that naturally comes with helping my mid-level high school students navigate long or potentially difficult texts is knowing how exactly to best engage them with the actual reading process. The students I serve benefit from reading as much of the text in class as possible, but especially considering their varying fluency levels, I avoid the controversial "round robin" or "popcorn" reading strategy. Sometimes they read in pairs, other times silently; sometimes I read aloud to them, or we listen to an audiobook, stopping along the way to discuss. But one different strategy the students enjoy-- one that seems to bring even shy readers out of their shells-- is Readers' Theater. I often see this presented as an elementary strategy, but my high school students really enjoy it and it serves only to further engage them with the text. I print out the full text of these chapters as scripts, as many as needed for each character who speaks, and then I highlight copies according to the part so each role is completely clear. Either I or a student volunteer will read the narration (anything that comes between the dialogue). With students at the front of the classroom, I find they often start discussion related to what they're reading without prompting. Even if they don't, it's not hard for me to jump in with a key question-- "why is Mayella treating Atticus with such contempt here?" and typically students from both the audience and performance respond. I'm always impressed with their insights. If you're hesitating about whether to use Readers' Theater in your high school classroom, don't! It's well worth the payoff in fluency, discussion, and engagement. When Beth Hautala posted on Twitter that she wanted to share ARCs of her new novel, The Ostrich and Other Lost Things, I jumped at the chance. Waiting for Unicorns, Beth's debut, remains one of my very favorite MG reads, so I expected her second book to be wonderful as well-- and it certainly is! Eleven-year-old Olivia Grant has a special knack for finding lost things, but she just can't find her brother Jacob's toy ostrich, and worse yet, ever since he lost it, his autism has seemed to worsen. Olivia loves her brother deeply, but struggles very authentically with the ways in which Jacob affects her ability to develop independently and with the attention her parents give Jacob in order to keep him functioning well. As Olivia nurtures her love for theater by auditioning for a role in Peter Pan, she must balance devotion to her brother with an understandable desire to spread her wings. Meanwhile, the excitement of a local traveling zoo and a growing friendship with the wise and supportive Charlie keep Olivia steeped in the mystery of where Jacob's beloved toy might have gone. I love Beth's lyrical writing and sensitive characterization, and admire that she develops equally sympathetic portraits of characters who are often at odds. We love everyone in The Ostrich and Other Lost Things, and we admire these characters' love for one another even as we witness the natural conflicts that arise from their competing desires. The book's hopeful message in the face of difficulty emphasizes the enduring power of family and true friendships. For teachers: There are so many real-world connections in this book, and in an age when we're all looking for ways to encourage our students' empathy, The Ostrich and Other Lost Things offers an opportunity for real conversations about interacting in loving, supportive ways with people who might not be considered neurotypical. Allowing students to research autism and to investigate how Jacob's behavior and role in his family might echo what they've learned could help students better understand the spectrum. That said, more general questions about how to cope with sibling rivalry and cultivate special talents will also appeal to students. They'll certainly relate to Olivia's conflicting desire to make her parents happy while also pursuing her own, and sometimes conflicting, goals. Writing about times in their lives when they've wanted to do something but felt another person, or people, stood in their way will help place students in Olivia's shoes. The Ostrich and Other Lost Things releases on February 20, 2018 and is available for pre-order on IndieBound and Amazon. You can also follow Beth on Twitter and check out her website! 1. Right off the bat, this book has a very intriguing title and cover; I just love the juxtaposition of an ostrich with "lost things," as ostriches strike me as so enormously noticeable that it's hard to imagine they could ever be lost. How did you come up with the idea of incorporating the whole concept of a traveling zoo into your book? The idea for The Ostrich and Other Lost Things was born out of my own inexplicable ability to find things—and not rest until things are found. I'm not nearly so talented as Olivia, and my skills come from always and ever chasing down my kids' things (as is true for most moms), but there is a certain satisfaction that comes only with finding something lost. I took that line of thought down the rabbit hole and started asking questions and making lists. What if there were a girl who could find almost any lost thing—except for one thing? Or what if that thing (a toy ostrich) actually represented a person—her brother? What if he was more found than she believed or realized? How do I take that idea and wrap it up in tangible concepts? I keep a running list of things that interest me or pique my curiosity and I started a page for this story. On it: zoos, Peter Pan, lost and found, disabilities, autism, tattoos, family bonds. I took my list and started looking for characters between the lines, and there I found Olivia, Jacob, Charlie, and all the rest. 2. Olivia and her brother are both such sympathetic characters, but in very different ways. As readers, we're torn because we see both of their predicaments-- Jacob's autism, and Olivia's desire to break free of the constraints that autism imposes-- but we also see their love for one another. What was it like for you to develop two characters who were very close, yet also at odds with one another? Challenging. Emotional. Tricky? All of the above! I think the very best relationships are riddled with dichotomy. We are drawn to the things we see in others that echo the things we know about ourselves—maybe even the secret things, or the things we fear. And conversely, we are repelled by those same things. Olivia fears what she thinks she knows about her brother, but she has this consuming desire to make life okay for him too—to protect him and shield him even though that's not her job. Jacob does the same for her, spending the entirety of the story trying to help his sister understand that he is more okay than she realizes. And I think maybe we do that for one another all the time. Friendships, marriages, sibling relationships, lovers. We are looking for ourselves in the faces of the people we care about, afraid of what we'll find and knowing it's worth the look anyway. Acceptance—love-despite-it-all—is a soul-level craving. I wanted to give kids a framework for what that looks like, and I hope I drew a little picture of it (a healthy one and realistic one) in Olivia and her family. 3. Charlie serves as a voice of wisdom in the book, and has had his own difficulties that inform the advice he gives Olivia. What is your favorite thing that Olivia learns from Charlie? Charlie was this wonderful surprise. He jumped off the page at me in full color and never left. He is everything I hope for in a friend and I'm so glad he came along for Olivia. My favorite thing that Charlie teaches Olivia is that she matters. Not for what she can do for others, but for who she is—right now walking around in the world. She is gold. Reflective. Bright. And she doesn't have to wear a mask or pretend to be anything other than she is. It's a lesson I wish I could go back and teach my younger self. But because I can't time travel (yet!) I'll try and tell those truths to my readers. Though, they're a smart crowd and probably know more about this stuff than I do. 4. As a parent, I was particularly moved by the scenes involving Olivia's parents struggling to meet both their children's needs. What are you hoping parents and children can come away from your book having learned or grappled with in regards to parent-child communication and relationships? As a parent myself, yet still walking around with very strong memories of my own childhood, I felt like I was trying to straddle an impossible line writing this story. One foot in the past, one in the present. I hope, more than anything, that parents and children can come away from Jacob and Olivia's story with a clear sense of The Love Anyway, that unconditional acceptance that should smolder and burn in families. That love that says, "You are enough, just as you are right now! And because I love you so much, I also dream beautiful things for you! But even if none of them ever materialize–or at least never materialize in the way I imagine, my love for you will never leave. It's Always and Anyway and Because Of and In Spite Of." Thank you, Beth, for sharing your words and Olivia's beautiful story with us! On a recent hike up Haystack Mountain not far from our house, my husband challenged our children to make it to the end of a particularly steep portion "without thinking about when you'll get to the top." "If your brain starts to think about it, that's OK," he said, "but try to just let the thought go. Only think about moving one foot, then the other foot. Only think about where you are." The children moved over rocks and roots with ease while I struggled to keep up. As I huffed and puffed, I thought about how much my husband's recommendation reminded me of writing. At any given point in the process, the more I think about how far I have left to go-- how long it will take for me to reach a certain word count, finish a draft, complete a revision-- the more easily I feel discouraged. But when I focus only on the progress I'm making at any given moment, I'm able to relish small successes and preserve the energy I need to keep going. When I began writing my first novel in the fall of 2014, had someone told me I wouldn't find my wonderful literary agent for another 2.5 years and that as hard as I worked on that novel it was never going to be the one that found me that agent, that I'd have to start all over again, I might have felt pretty discouraged. But now that I've reached this point in the journey, I know how much I needed to take every step that came before it. I needed to write the novel that didn't work so I could write the one that did. When we got to the top of Haystack Mountain, we were rewarded with one of the loveliest views in Vermont: mountains rippling endlessly to the horizon, three lakes nestled between. Like every moment of true satisfaction, it only came with effort. Writers, take heart. You might not know at this moment how long it will take you to get where you want to go. Just don't ever stop going. Signing my contract with Katie Grimm of Don Congdon Associates! For information on what exactly getting a literary agent means, I highly suggest hopping over to Amanda Rawson Hill's wonderful blog post: "When Someone You Love Gets an Agent" (the "Okay, so what happens now?" section in the second half is particularly helpful for folks who don't have much experience with the world of publishing). For even more background on why someone would want an agent in the first place and the process required to get one, read "When Someone You Love Is Querying." You're never supposed to begin your novel with backstory, but that's where I'm starting for this blog post. When it comes to writing and querying, I think it can be helpful to show how far back the process can begin, and I've been writing for as long as I can remember! I wrote short stories and kept diaries throughout elementary and middle school. In high school and college, I immersed myself in poetry, and in my early twenties I started writing creative nonfiction. I remember exactly when I decided I wanted to start writing children's novels. During a rare quiet moment in my kitchen in the fall of 2014, I was thinking about books (typical), and wondering why I couldn't recall any that depicted a third culture kid's experience. I'd taught in international schools overseas for four years and felt strongly that my students, whose lives contained indescribable richness but also often a sense of cultural confusion or loss, deserved to see their stories reflected in literature. I could also relate to their experiences, having lived overseas with my family for a period of time the year I turned thirteen, and I suddenly felt a sense of renewed energy and purpose: I'd write the book I wanted my students (and my younger self) to have. So I did. I made myself a calendar, committed to a daily word count, and finished my first draft in a few months. When I felt too tired or stuck to write, I'd research literary agents and the publishing process. I hit "send" on my first query in 2015. I absolutely needed to write that book, but it wasn't the one that would get me an agent. Though I had phenomenal guidance from Taryn Albright and received positive feedback on a few full manuscript requests, I also received pretty much the same criticisms from everyone. As I'd learned more and more about what made books work, I realized the criticisms were spot-on, and after three months and twenty-two queries, I decided it was time to let go. I felt a little sad at first, but not really. I had a new book idea, one I thought would be able to fix the problems that plagued my first one, and I was anxious to get started. Walking through the woods with my dog one day, I'd discovered a new character working her way into my brain. Her name was Addie, she lived in Vermont, and she loved the lake near her house but had also lost her twin brother in a drowning accident there, and she needed to find out whether the magical sea creature he'd believed in was real. I cared so much about Addie and the characters that emerged as I clicked away on my laptop. The late Vermont writer Howard Mosher, my beloved friend and neighbor who had read my first manuscript as well as this one and always gave me just the gentle encouragement I needed to keep going, told me I had a good story, which gave me hope. I also had the support of a newly found and absolutely wonderful critique partner, Nicole, who provided invaluable feedback and accountability. When I started drafting THE LIGHT IN THE LAKE, I was working two part-time jobs and juggling classes I needed to renew my teaching certificate, so it took about a year to finish the first draft. Anxious to be sure I was on the right track, I sought early feedback from Zoe Strickland at Teen Eyes Editorial and began editing. I also started a new job teaching high school English full time, and it took me another year to fully revise. During that time, I was fortunate to move up the waiting list for a spot at Vermont College of Fine Arts' Writing Novels for Young People retreat not far from my house, which meant I got to spend a whole weekend with very smart, helpful, and inspiring writers. Eventually, I sent my first query to an agent who had offered feedback on all queries sent during a certain time period. I decided I'd wait to query anyone else until I'd heard back from that agent. In the meantime, I also worked with the wonderful Jeni Chappelle and revised some more, only to receive a full request a few months after I'd sent that first query! I took it as a good sign and sent more queries. Several full requests quickly followed, most from agents who had rejected my previous work, which felt exciting. But a month or so later, I got a rejection on a partial, and later, my first rejection on a full. I knew the publishing world moved slowly, but I was feeling discouraged. And then something funny happened. A few hours after receiving my second rejection on a full, I got an e-mail from an agent offering representation! I could barely process the message; I was just about to take my kids into a gas station so they could use the bathroom, and they got to hear me shriek a little about it. "Someone wants to help you publish your book?!" my eight-year-old shrieked back. Three days after that first offer, I received a second, and three days after that, a third. I felt, and still feel, incredibly honored that these talented agents believed in my book. I enjoyed my talks with all of them; agents are truly lovely people! But there was one agent with whom I felt a very immediate sense of connection and trust. We spoke for over an hour by phone and I just knew deep down that her incredible vision, professionalism, editorial wisdom and industry experience perfectly matched what I wanted. I signed with the amazing Katie Grimm of Don Congdon Associates and could not feel more grateful that I've been given the chance to build my writing career with her! It's a dream come true. Growing and moving forward as a writer can take time and it's easy to second-guess yourself, but one of the most helpful pieces of advice I clung to during this process was something the spectacular Sarah Aronson said at the VCFA retreat. I was so inspired by it at the time that I wrote it down word for word, and I've returned to it many times since: "You are not behind. You are not lagging. You are not supposed to be somewhere else. You are exactly where you should be." Whenever I find myself lamenting that I should be moving faster, or that I should've done all of this this in my twenties, or whatever, I remember what Sarah said. It's hard to juggle a job and kids with writing. A supportive partner and a schedule make all the difference, and I'm lucky to have both. Whatever your situation, you do owe it to yourself-- and to the people in your life who love you and want to see you happy and fulfilled-- to steal that time to write. Over the course of the two years I worked on THE LIGHT IN THE LAKE, I sought a lot of feedback from a lot of different people: my CP, beta readers, workshop participants, editors. Ultimately, all of this input, both what was contradictory and what was consistent, taught me a lot about how to ultimately trust myself more as a writer and also how to recognize that it's important to build self-confidence but also to know that every writer needs another set of eyes. It only takes one "yes" and that yes might come very unexpectedly. An agent might not inform you that they've started reading your manuscript, or that they're halfway through and enjoying. They might not follow you on Twitter first. They might just suddenly offer representation, leaving you with your jaw hanging open at the gas station where you randomly decided to check your phone. More ideas will come. It took two years, but I now know how I want to fix that first novel-- just as soon as I finish writing the other manuscript that popped into my head while I was querying this one! You have to write that first book. Learn what it has to teach you. And then keep going. "I'm just going to leave my Google Doc right up here on the board," I said, pointing to the projected list of interview questions my high school students had generated for our Humans of New York-style writing and speaking project. "I'll write an answer to the question you pick and you can watch while you're working on your own." My students seemed interested. They'd each drawn one of their classmates' questions out of an envelope at random, and I'd asked the last student to pick two and choose one for me to answer. Everyone got right to work, writing on a laptop or by hand (I like to give that choice), but at different points, all of them focused on my Google Doc, watching my words stumble across the page, unfolding in real time. They saw me hit the "delete" key, fix typos, add more detail to sentences, and pause when I felt stuck before continuing to write. They heard me read my words aloud and revise as I went ( "oh, I'd go back and add more information here"; "I'd probably change this word"). They identified what I'd done well and we used those comments to build a rubric they could use for their own writing. Instead of telling them that knowing how to start a piece of writing can be tough but brainstorming helps, that sharing personal work isn't easy but can be rewarding, that revision is necessary-- I showed them. Sure, I felt a little nervous; it's the beginning of the year, and we're all still getting to know each other. But I really believe that when teachers write in front of students, it doesn't just help students learn more about the writing process; it builds community in the classroom. Kwame Alexander's The Crossover won both the Newbery Award and the Coretta Scott King Award, but that's not why I know my students will be devouring the book during our independent reading unit this year. From the very first page, this book just moves. Told in lively verse from the perspective of 12-year-old basketball star Josh Bell, its playful rhyme and staccato beat seem to mimic a ball bouncing down a crowded court. And it's not just about sports; through Bell's struggles with family and friends, plus a heart-wrenching twist towards the end, the poetry just soars. For teachers: The Crossover offers wonderful opportunities to explore rhythmic language, and its popular premise-- basketball-- will help draw even reluctant readers of poetry. It's also a shoo-in for cross-curricular partnering: working with a physical education teacher to allow students to literally practice on court the skills Alexander describes with such vivid detail, or with a music teacher to experiment with how instruments could enhance Bell's "mad beats." Students could try writing in Alexander's style by describing a physical activity they enjoy using onomatopoeia, rhyme, a distinct rhythm and a physical pattern of words on the page that match their movement. While this book is technically written for middle grade readers, I'll be recommending it to my tenth graders in a heartbeat.